Highlights from the New Year's Day concert, featuring waltzes, polkas and marches from the Strauss family, music by Richard Strauss and performances from the Vienna State Ballet. 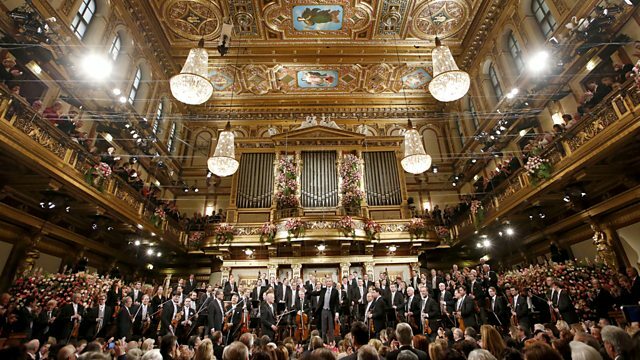 Highlights from the traditional New Year's Day concert, performed by the Vienna Philharmonic Orchestra and conducted by Daniel Barenboim. Alongside waltzes, polkas and marches from the Strauss family, there is music by Richard Strauss and specially filmed performances from the Vienna State Ballet, choreographed by Ashley Page and with costumes designed by Vivienne Westwood. The concert at the Musikverein Large Hall is also broadcast on BBC Radio 3.